Apple's Touch ID not only allows you to unlock your phone using your fingerprint, it also allows you to verify an Apple Pay transaction. Your fingerprints are supposed to belong only to you, making identifications using them "positive." But what would happen if it turns out that a fingerprint scanner isn't such a great security tool? A group of hackers, the largest such group in Europe, now says that they can take a few photographs of your fingers, and employ commercially available software, to break into a fingerprint recognition system. The claim was made by the Chaos Computer Club at their 31st convention. Using the VeriFinger software, the Club's Jan Krissler copied the thumbprint of German Defense Minister Ursula von der Leyen. Krissler used photos showing a few different angles of the Defense Minister's thumb to help produce the image. If the Chaos Computer Club sounds familiar, you might recall that last year the group announced that it had developed a way around Touch ID on the Apple iPhone 5s. 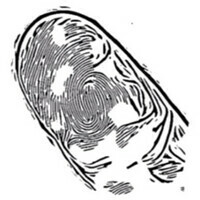 The process involved the production of a latex sheet that would include an image of the "stolen" fingerprint. The sheet would be used to trick Touch ID into believing that the phone's owner was pressing the handset's home button. The latest technique involves the use of a regular camera and widely available software. The pictures of the German Defense Minister's fingers used for the demonstration, were taken during a press conference in October. This doesn't necessarily mean that fingerprint based security measures like Touch ID are useless. Nor does this mean that you should be wearing gloves at all times in case someone wants to snap pictures of your fingers. Just keep in mind that fingerprint scanners are just one tool in your arsenal against those who want to steal your personal data. This might be a wake up call for those who should be looking at multiple methods for securing their phone. That's why not only do I have a passcode, but I also never under any circumstance lay my phone down. It's either in holster, or in my pocket. It's s also good that I'm not a target, people see me, and say nope not him, get someone else's. Pahaha, puny human, you're THE target. You're always targeted on here by most users. In real life, you're just a big adult, acting like a child....? ...there also has to be a reason for them to WANT YOUR information... people see me and say nope not him because they could care less about getting my info. When did you become a police grammar? You couldn't read and write a year ago. Now whenever you find a error, you poke and troll other users. "When did you become a police grammar?" Looks to me like you still can't read or write. I highly enjoyed the irony of your post though. Thank you. Sir-Lancelot, from now on, I shall call you "a police grammar"... A deserving title.. don't you think? From now on, I shall call you "Banned"... A deserving title.. Don't you think? Wrong!! dirtydirty00 has it right. The correct usage is "could care less". "Couldn't care less" employs a double-negative. If you're going to be the internet grammar police, have the decency to know what you're doing. It is "couldn't care less". It means that you literally cannot care any less than you currently do. To say you could care less means that there is still less caring to be done. It makes no sense. A simple Internet search will show you that. If you think that is a double negative, you also need to re-read the rules of grammar. And now apparently snap a photo of your finger while sitting nearby you too. This article just shows that no matter how high tech the solution is. If someone is determined to get your info they will. We must understand these are tools used to deter your average Joe from trying to gain access. It's important to understand security comes through practice and not technology. As Technology advances so do people and so everything and everyone must be accounted for. Paranoid individuals prepare your self. Physical security trumps all. Keep the device with you. Funny how security is unimportant when discussing BlackBerrys, but it becomes the number one topic when somebody else's favorite platform gets hacked to ribbons.